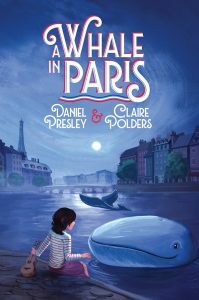 A hopeful and heroic girl befriends a lost whale during World War II, and together they embark on a journey to find their families and liberate France. Ever since the Germans became the unwelcome “guests” of Paris, Chantal and her father have gone out in the evenings to fish in the Seine. One night, hoping to catch a salmon, Chantal spies something much more special: a whale! He seems friendly, lost, and small (for a whale). Chantal opens her heart to the loveable creature and names him Franklin, after the American president who must surely be sending troops to rescue her country. But Franklin is in danger: The Parisians are starving and would love to eat him, and the Nazis want to capture him as a gift to Hitler. In a desperate bid to liberate themselves and their city, Chantal and Franklin embark on a dangerous voyage. But can one girl manage to return a whale to the ocean and reunite him with his parents? And will she ever see her own family again? the MackinVIA Community‘s Great Speculative Fiction List.